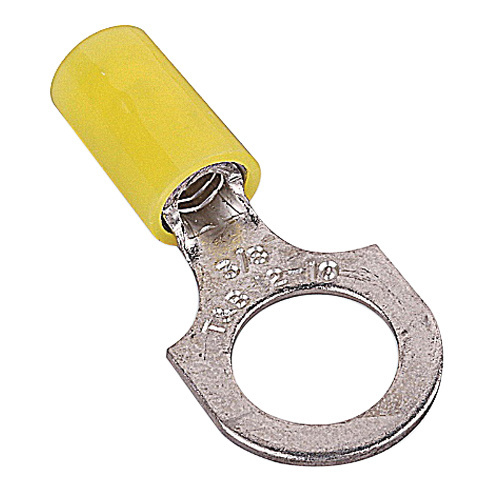 Thomas & Betts Sta-Kon® RC Series Insulated ring terminal in yellow color, accommodates conductor of size 12 - 10-AWG. It features tin-plated copper construction for good conductivity and corrosion resistance. The 1-Inch long terminal with #8 stud, has tang of size 0.37-Inch x 0.04-Inch. Nylon insulation of this terminal offers better protection against short circuits. It withstands a voltage rating of 600-Volts and temperature rating of 105 deg C. This terminal is suitable for use WT2000, WT112M, WT145C, ERG4001 and WT145A tools. Terminal is UL listed, CSA certified and RoHS compliant.